© and (p) 2010 Z-BOP. All tracks written and produced by Gary Kempston. The time for the next in-depth digital statement from Z-bop artist Goliath has arrived. During the course of recent years, the Goliath sound has grown both in its reach and stature - with pivotal appearances on Solar One Music, Minimalsoul and Open Concept Recordings. This exposure combined with the producer's naturally prolific habit has resulted in an outpouring of deadly new material - taking in advanced sound-waves, dimensions and production values. With this in mind, the release title itself serves as a caution to the listener. Prepare to be pulled in by way of 'Gilgamesh', a deceptively calm intro piece which gains momentum double-quick leaving you lost and gasping for air. 'Ecce Monstrum' continues to disorientate with precision impulses concentrated on your temporal lobe. With you suitably conditioned, 'Physica' can proceed to convince you that all is well and that you are completely safe, your head nodding in acceptance to some new strain of narcotic funk. Goliath's sinister 'Hidden Agenda' can now be revealed - there's dirty work afoot here, listen closely! 'Wanderlust' provides further neurological disturbance by way of a series of fundamental sensory input sequences. The program closes with 'Infiniti', carrying you back to where you started, but now with various unexplained cognitive adjustments. 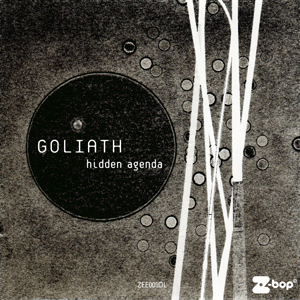 "Goliath is Clatterbox's younger brother Gary Kempston, and 'Hidden Agenda' is his second EP on the excellent Z-Bop label. Six tracks of fearlessly experimental electro, taking a turn towards electro-acoustics at times. Fierce, unique and futuristic music." "Four years after his 'Mineral Kingdom' album, Goliath returns with a new single for the Z-Bop imprint. 'Hidden Agenda' features six tracks of sci-fi-infected electro, working with a pared-down palette of hardware for a focused and efficient set of tracks catering for the floor or home listening. From tentative, skittering oponer 'Gilgamesh', 'Ecce Monstrum' becomes more agitated, dropping us into the Drexciyan 'Physica', the EBM-ish darkwave of the title track and concluding with the dystopian Der Zyklus type effort 'Infiniti'."